In Olympic National Park, ancient rainforests and ocean tidal pools at lower elevations contrast with wildflower-filled alpine meadows and snowcapped peaks. Olympic National Park is known for nature, scenic drive, beaches, trails, and parks. Your plan includes some of its best attractions: hike along Hurricane Ridge, contemplate the waterfront views at Crescent Lake, take a peaceful walk through Hoh Rain Forest Visitor Center, and stroll through Second Beach Trail. To find where to stay, maps, traveler tips, and more tourist information, read our Olympic National Park online trip itinerary builder . Cleveland to Olympic National Park is an approximately 56-hour train ride. You can also take a bus. Due to the time zone difference, you'll gain 3 hours traveling from Cleveland to Olympic National Park. Prepare for little chillier weather when traveling from Cleveland in September: high temperatures in Olympic National Park hover around 67°F and lows are around 50°F. Cap off your sightseeing on the 4th (Wed) early enough to catch the train to Portland. Venture out of the city with trips to Astoria Column (in Astoria), Multnomah Falls (in Bridal Veil) and Haystack Rock (in Cannon Beach). 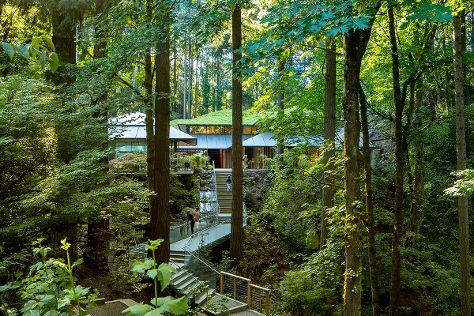 Next up on the itinerary: admire the natural beauty at Portland Japanese Garden, trek along Forest Park, stop by Powell's City of Books, and contemplate the waterfront views at Columbia River Gorge National Scenic Area. For reviews, other places to visit, ratings, and more tourist information, read Portland road trip website . Take a train from Olympic National Park to Portland in 5.5 hours. Alternatively, you can take a bus; or take a bus. When traveling from Olympic National Park in September, plan for somewhat warmer days and about the same nights in Portland: temperatures range from 76°F by day to 55°F at night. On the 10th (Tue), wrap the sightseeing up by early afternoon so you can travel back home.